The 27th annual Great American Beer Festival is over and, now that my liver and other assorted organs have sufficiently recovered, I can tell you all about it. This was my 8th foray into the lunacy that is the GABF. The week of the event is always a very busy drinking week for me. Let me give you a little taste, you know…an ounce at a time, of the most hallowed week in the beer-year. GABF began modestly in 1982, held at Boulder’s Harvest House hotel, with 22 breweries, 40 beers and 800 total attendees. That’s a very small festival by today’s standards. The festival has grown from those early days in Boulder to a mega-fest that draws beer enthusiasts from over the globe to Denver. 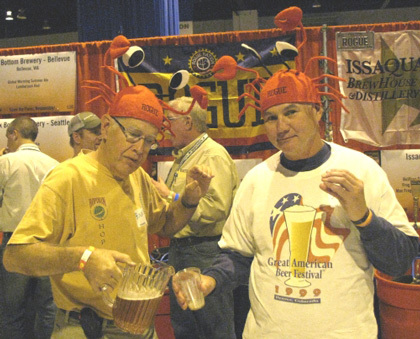 The 2008 festival had 432 participating breweries, 1800 beers on tap, and a total attendance of 46,000 people. Okay, gulp that down and let’s move on. As tradition dictates, the first night, Wednesday, starts with the annual brewer’s dinner at the Wynkoop brewpub. Founded by brewer and the now Mayor of Denver, John Hickenlooper, the Wynkoop is a great example of early 1900’s architecture, with lots of wood, pressed tin ceilings, and the beautiful original bar from Denver’s old Tivoli Brewery (1900-1969). Three levels of entertainment await inside, Impulse Theater and the brewery in the basement, drinking and dining on the main floor, and the pool-hall-of-your-dreams upstairs. As usual, the place was packed with the Who’s Who of craft brewing and I was right in there rubbing elbows with them, which can get pretty messy when everyone is holding a beer and a plateful of finger-food. Special libation stations were set up in strategic locations with craft beers specially donated by the brewers for this event. Were they good? Oh my, yes. Can I remember their names? Not really. (Sorry, when you have as few functioning brain cells as I do you have to economize) Wait, there was one…Alaskan Brewing brought a keg of fourteen year-old Smoked Porter which everyone raved about and no one dared cue up for more than once because they wanted to make sure everyone got a little. The aged beer was a delight. Its slightly smoky nose was followed by a soft malty taste highlighted with notes of sherry, currant, and raisin. A light bite of hops and mild smoke in the finish made it the most perfectly aged smoked porter I’ve ever had. Moving on from the Winkoop, (Don’t forget to rinse your glass between samples!) I moseyed on over to another place synonymous with Denver and great beer, The Falling Rock Tap House in LODO. If you visit Falling Rock during GABF go early or brace for crowds that make a rush hour Tokyo subway train seem spacious in comparison. The Falling Rock has the best tap selection I’ve seen in Denver. They’ve also cultivated a great relationship with the craft beer community. That means if you want to meet Rogue Ales founder Jack Joyce, go hang out at the Falling Rock. Dogfish Head’s Sam Calagione, hang out at the Falling Rock. Brooklyn Brewery’s Garret Oliver? Hang out at the Falling Rock. Looking for me? Check the Hooters across the street. (Just kidding, the Hooters closed last year.) In short, everyone who’s anyone in beer eventually ends up at the falling Rock; it’s the “Wailing Wall” of the Denver beer-scene. On Thursday I was up at the crack of noon with a slight thumping between my ears. I scraped the crust from my eyes and made my way over to Michelob’s media event for a little hair of the dog. Michelob was introduced by Anheuser Bush in 1896 as a “draft beer for connoisseurs”, and they’ve maintained that connoisseur image thru the years. As craft beer gained ground in the marketplace Michelob expanded their craft efforts. Currently they offer 15 styles. Most of the beers I tasted were pretty good; my favorites were the Shock Top Belgian Wit and Honey Lager. The food at the event was, of course, stellar, and I would have liked to hang out and eat 10 to 20 more pounds of shrimp but the opening of GABF loomed and I had to be there. 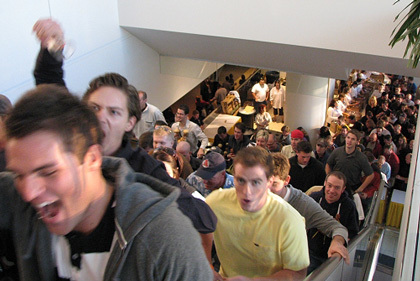 I counted myself lucky as I entered the Colorado Convention Center, using my sacred press credentials to avoid the mile-long line of beer enthusiasm snaking around the building. The event had sold out yet again, at $50 apiece an impressive accomplishment in these trying economic times. I positioned myself in a place I wouldn’t be likely to be run over by crazed beer enthusiasts, less than 20 feet away were 1800 beers (2052 beers if you include those sent in for judging only). Beers with legendary names like Dreadnaught, Midas Touch, and Abyss; Scary names like Double Dead Guy Ale, Blind Pig IPA, and Dragonstooth Stout; Provocative names like Sexual Chocolate Imperial Stout, Mr. Banana Grabber, and In Heat Wheat; and fun names like Smoked Frog, Le Freak, and Naughty Goose. All so close now the air crackled with excitement. When the magic time tolled, I was there, clicking away with my camera, documenting the traditional headlong rush of humanity. Up the stairs they came, wild-eyed with excitement and dressed for Mardi gras, except instead of beads most wore necklaces of pretzels. Were these hardy enthusiasts up to the challenge of consuming over 18,000 gallons of America’s best craft beer? You betcha! The rest of the opening day was a blur of smiling faces, rolling roars that sprang forth with every cup drop, and lots and lots of craft beer. There’s something funny that happens when you’re tasting beer after beer, each good in its own way, then you hit something superior, special, and it stops you in your tracks. I found several standouts that first night. The first was when I reacquainted my taste buds with New Belgium Abby Ale, a truly great beer. How could I forget how good it is? Other beers I paused to savor were Portsmouth Brewery’s fantastic oatmeal stout and Gordon Biersch’s Vienna Spezil. Gordon Biersch also had the strangest beer I tried that day, Berliner Weiss. It tasted a little like Apple Jacks cereal. Since I always liked Apple Jacks it wasn’t bad, just a little strange. A dizzying number of events filled the Friday to-do list before the fest reopened. Starting with the annual media event where I was treated to a wonderful beer-paired meal. Appetizer – white bean custard with greens and caramelized onion vinaigrette paired with Sierra Nevada Pale Ale. Salad- Bittersweet field greens, bittersweet chocolate, nuts, Asiago cheese and berries covered with a light balsamic vinaigrette paired with Red Rock Organic Zwickelbier. It’s worth mentioning that there’s more than just beer sampling happening on the fest floor each day. I enjoyed the live game show “Win Beer Stein’s Money” on the main stage hosted by Celebrator magazine’s Tom Dalldorf. Silent Disco was back, a spectacle of headphone clad dancers gyrating to music only they could hear. You could find out how to be a beer judge one on one from the GABF beer judges. There are ongoing beer-themed cooking demonstrations, beer book signings, a Fresh Hop beer booth, The Canned Beer Symposium, the ProAm competition, etc. So forgive me if I missed something. Saturday started early as I dragged my poor tired bones to finals of the LongShot homebrew competition. Samuel Adam’s LongShot competition drew more than 1,300 consumer entries in 2008. This year’s winner was Alex Drobshoff of California. Carissa Sweigart won the employee brewing contest. Drobshoff’s Traditional Bock and Sweigart’s Cranberry Wit will join last years winning Double IPA made by Mike McDole in the new LongShot six pack to be released in April. Silver – Bamberg Hellerbock, brewed by Starr Hill Brewing Co., Matt Reich and AHA Member Lyle Brown. Bronze – Irish Red, brewed by Odell Brewing Co., Doug Odell and AHA Member Alex Grote. Saturday was also the day the annual Alpha King Competition was held in the basement of the Falling Rock Tap House. The Alpha King contest has been held during the Great American Beer Festival for the last 10 years and it’s always held in the basement of the Falling Rock Tap House. The Alpha King is a high IBU pucker-fest as bottle after bottle of extra hoppy beer is poured for eager fans while the judges ponder the hopitude of each beer behind closed doors. 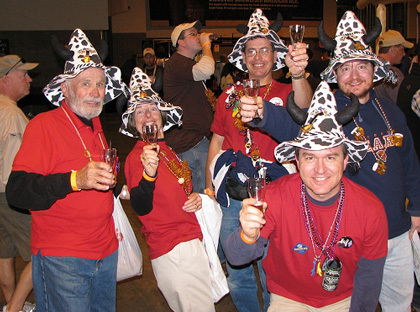 Port Brewing’s Hop 15 was proclaimed the 2008 Alpha King – this year’s hoppiest beer in America. Ralph Olson of Hopunion presented the crown of hops to Port’s head brewer Tomme Arthur. The Runner up was Boundary Bay IPA. (Boundary Bay Brewing won this national contest two years ago.) 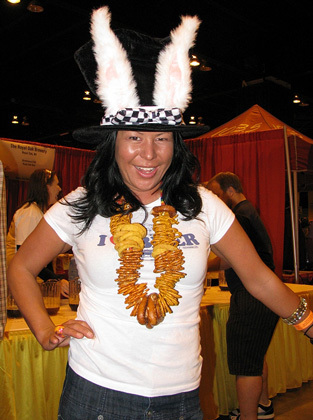 Third place prize went to Chama River Brewing Company’s March Hare. The rest of the day was a blur of awards presentations and more sampling on the GABF floor. 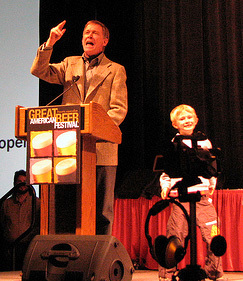 The most memorable part of the awards presentation was when Mayor John Hickenlooper brought his young son up on the stage with him. While he was talking his son began to mug for the crowd. I’m not sure who was being applauded at the end, John for his speech, or the kid for keeping us entertained during it. If you’d like to see who won medals at this years GABF visit the Brewers Association. There seemed to be a lot of state pride in the cheering during the presentations so I thought I’d mention the top-five states by medal wins at the 2008 GABF. Did that seem like a pretty hectic 4 day schedule to you? Are you feeling a little dizzy? GABF is intense! As I wedged myself into my airline seat early Sunday morning my mind was spinning as I pondered how to cover it all here. If this article seems rushed, disjointed, and a bit strained… welcome to my world… and welcome to GABF, a beer festival like no other. More GABF pictures can be found at Flickr. Pictures of all medal winners can be seen at this Flick photo set.